Garderobe Door Contact - Misensor Tech (Shanghai) Co.,Ltd. Many kinds of our magnetic reed switch is working well with DC voltage . DC01B,DC02B,DC01A and DC02A used a reed switch contact a SCR , to make the swith can work well with AC voltage . 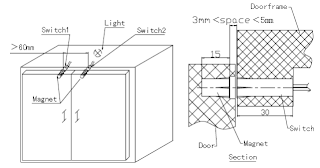 The DC01B and DC02B are normal closed types sensors .Customer need to fix the switch on a stationary parts and install the magnet to a activity door .When the door is open ,the reed switch is closed , the light is turn on ;when the door is closed ,the switch is open and light is turn off .